What Place Does Extreme Frugality Have In Your Life? 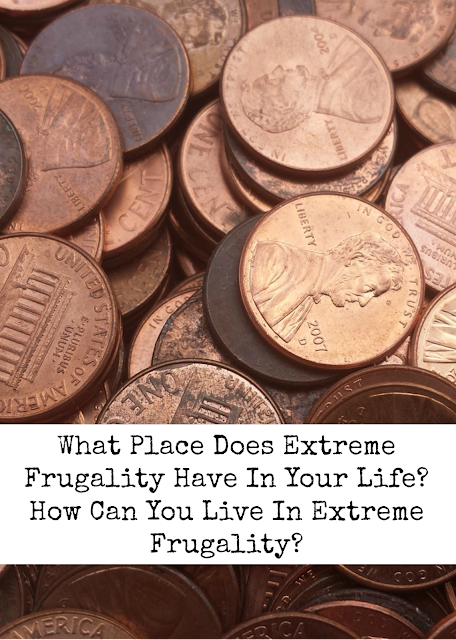 How Can You Live In Extreme Frugality? One of the ideas that have been on my mind has been extreme frugality. I am currently in saving money mode (which is normal) while trying to amp up my frugality game. I am back to using paper coupons, digital coupons, Ibotta, SavingStar, and much more. I'm paying a lot more attention to sale flyers and really deciding if I need any of that which, by the way, is in direct conflict with the stockpiler in me! However, along with being frugal, I want to have a bigger impact on my savings and my spending game. To save more money and spend less money, you have to make more meaningful decisions about where your money goes and how your money is being spent. In short, you have to become more extreme in your frugal living game. Frugal living has several aspects. One of the biggest aspects of frugal living and practicing extreme frugality is daily living. You have to examine every decision you make every day. Because being frugal is not just saving money on just big purchases, but being consciously aware of the money being spent on small daily purchases and how you are using the items you already have or purchased. Whatever reason(s) you decide to practice extreme frugality, you need to know why you are doing it. Write down those reasons and place them everywhere you need to see them (office, computer, wallet, kitchen, etc.). Every decision you make in a day should be examined for frugal reasons. There are always ways to save more money. There may not be things you are willing to do to save more money. That is okay, but ask yourself why you are not willing to go that far to save money or not spend money. If saving/not spending money will hurt yourself or harm your family, then you shouldn't be doing it. There is a fine line in extreme frugality and withholding a critical necessity or service to not spend money is crossing the line. Extreme frugality may bring on extreme cheapness. In some cases, being cheap is not a bad thing. People may view you are cheap just because you are not willing to buy something, go to a "party" for the sole purchase of buying something or will not go out bar hopping. That is not being cheap, that is being frugal. Being cheap is only spending what you have to without thought to others or yourself and potentially causing harm. Being cheap is also spending the least amount of money possible even though what you are purchasing is pure crap and you will be buying a new one when that item breaks easily. Being cheap is also taking advantage of a situation to get something free or get the upper hand over someone just so you don't have to spend anything. I could go on about being cheap and sometimes it is a good thing, but not usually. Look for free things you can do or take home. Take advantage of your library for books and movies. Look for events around the area that do not cost you anything but maybe gas money. Look for things that people are giving away for free. Be a curb shopper, dumpster diver, free garage sale box looker. Be creative with what you have and what you find. Have staycations often and keep them as frugal as possible. Learn new skills with items you already have. Don't say no when someone wants to treat you or your family. You can still live a full life even though you have your nose to the extremely frugal grindstone. You can still have fun. You can still be involved in things you love, but just be conscious of what it is asking of you financially. Some groups and things are fun, but if you are constantly bleeding money to be in while trying to actively save money, something is wrong. You may have to let those things go for a time while you are being extremely frugal. While being extremely frugal is a very good thing, you still have some things to keep in mind. Being an extreme frugalister can make your mind think some funny things. Like you shouldn't throw anything away or give anything away. Like you should be a hoarder. That couldn't be farther from the truth! Yes, by all means, keep what you can use or think of a use for. However, if you have things you cannot use at all, you should give them away, sell them, donate them, or responsibly recycle them. Please don't be an episode of one of those shows! If you have stuff not serving you, do something with it. Your home shouldn't be a fire hazard because of the stuff you own. Lastly, you have to be intentional in your extreme frugal game. You have to be content with what you already have. If you are used to shopping a lot, you need to figure out why and stop. You have to be happy with what you have and not use shopping as stress relief. You have to be content with what you have and not be envious of what the neighbors have. You do not need to have the latest, greatest things. That is not being contented. You need to be content with the ten-year-old car and a house without a pool. You need to be happy with wearing out your clothes without buying this season's newest fashions. You need to be okay with bringing your own lunch and not going out to lunch every day or every week. You have to be content with what you have and your decisions to save money so you can achieve your goals. Otherwise, being extremely frugal will not be an easy process for you. Extreme frugality is not for everyone, but everyone can do it. You can try it for a short amount of time or the rest of your life. You never know when you will need to be extremely frugal so being extremely frugal now will only serve you later. I would encourage you to give it a try and make it work for you! Is It A Need Or A Want? What Should You Spend Your Money On?